Below you will find our normal 100 Square Grid. 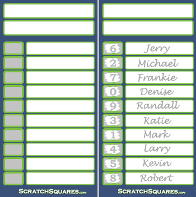 We also have the Halftime Squares and the Quarter Squares, where the numbers change each half or quarter. 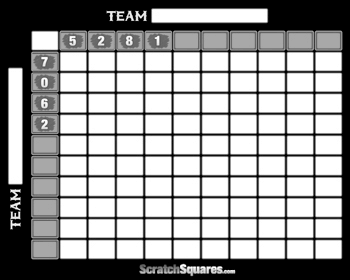 Once the grid is full simply remove the scratch off material to reveal the numbers that will be used to determine the winning squares. 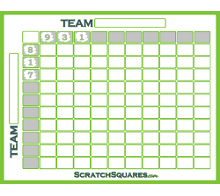 A winning square is a square that intersects the last digit of each team's score. There should be a winning square at the end of each quarter. There are also many variations to declaring winners, such as every square touching a winning square is also a winner or the reverse of the winning numbers is also a winner. There are no set rules, you can get creative when determining winners, just be sure all of the rules are explained before the pool begins.